[From IMDB:] Joshua and Penelope are survivors of a deadly infection that laid waste to humanity 25 years ago. When they encounter fellow survivor Abira, their lives are forever changed as they fight off the remnants of the infected. First up, I have to say that it’s pretty amazing that Chrysalis was made on a crowdsourced budget of around $30,000. I didn’t get the impression that it was a particularly low budget film while watching it, outside of the fact that some of the creature make-up was (not bad, but) somewhat limited. The film and sound quality were both good quality, and while the story may have relied a bit too heavily on predictable cliches in the final act, it was clear and consistent in the message it was conveying. You may have picked up by now that consistency is a big issue for me, so I’m glad to say I don’t have too much to complain about for once. 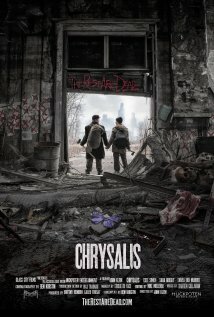 Chrysalis is a movie that’s primarily driven by the interactions of its three main characters, all of whom were commendably portrayed by their respective actors. In fact, it’s this strong focus on characterisation that was my favourite aspect of the movie, despite the occasional twinge I felt at how certain reactions to events (particularly coming from Penelope) didn’t exactly ring true to me, given their circumstances. Is Chrysalis an amazing, flawless movie? No. It definitely has its issues. But for an indie film working on such a small budget, I think it did a damn good job of bringing something new to the zombie-esque horror movie genre. I hope the team gets an opportunity to make more movies in the future.